Check out the incredible Andson staff at the Las Vegas Library, featuring Guadalupe Maria, Cliff Goldkind and Zoie Yell! Students receive homework help at the Las Vegas Library on a regular basis and have developed a special bond with their Andson tutors and aides. Cliff and Zoie are devoted to providing students with exceptional guidance and encouragement to grow academically. It’s a privilege to have such passionate individuals guiding our students to academic success! When it comes to making resolutions, I’m typically of the mindset that if it’s important enough, why wait till the 1st of the year? I tend to do what drives me now. However, over this last year I realized that two bad habits can go hand in hand, and I had let both slide: household clutter, and wasting money. Tackling these issues brought me peace of mind. Why did I let this weigh on me so heavily? They say a cluttered house is a cluttered mind. Now don’t get me wrong, my living spaces are far from uninhabitable but there is a feeling of being overwhelmed that comes with keeping every receipt, that infamous junk drawer in the kitchen, and the years of collected toiletries you’d never miss if you tossed them out today. So I bought a book called The Life-Changing Magic of Tidying Up by Marie Kondo. I know, I know, another paper object adding to the clutter! Along with this book, I watched a documentary and several videos (here, here and here) on living a minimalist life and the concept appealed to me. Over the break I tore several rooms apart, making me realize that decluttering can quickly bring your finances into focus. Luckily with the help of some minimalist YouTubers, it won’t cost an arm or a leg, which brings me to exhibit 2: saving money. In my early twenties, I was an impulse buyer. I would come home with all my new goodies only to have buyer's remorse within days, sometimes even within hours. I quickly changed the habit by jotting down what I wanted while out shopping. If by the next morning (or the following weekend) it was still on my mind, I’d go out and get it. This is something I still do today. However, every once in a while I still buy something I end up regretting. Nothing makes this as apparent as dumping all of your belongings into a pile in your room. Decluttering is one thing. Tallying up the money spent on unwanted items really is a punch in the gut. It’s difficult to acknowledge your faults sometimes. You can put off unpleasant tasks like this for years, but what a sense of relief you get from facing and resolving these challenges head on. The holidays are a time where the spirit of gifting often turns to clutter down the road. Maybe a little more thoughtful, human interaction, a little less stuff? Here at Andson, we are passionate about teaching young people delayed gratification, and how an ongoing attitude of humbleness will in turn make you less reliant on chasing possessions. Of course, we want them to SAVE SAVE SAVE for their future. Sometimes it’s difficult to take one’s own advice. Don’t judge me, I’m NOT an Andson money coach! Decluttering your space is a great way to open your eyes to how much money you’re spending. Let’s rephrase that. It can open your eyes to how much money you’re WASTING. Can you relate to my dilemma? Is decluttering your personal and financial life within your grasp? We’d love to hear your thoughts on using this “twofer” technique to bring your finances into focus! Meet Grant Frailich, our jolly tutor spotlight for December! Grant was first inspired to teach when he saw the impact his older brother had on young learners. Grant's favorite subject is math, but he's also super enthusiastic about encouraging students to read. "Read! Every single day, pick up a book and read some of it. Reading takes you to any world you want to visit and it's fun!" He is passionate about each and every student in the world receiving access to quality education. Grant grew up in Phoenix so he's no stranger to the desert! He enjoys working our (preferably when it's not too hot), and spending time with his girlfriend and baby cousins. You're a swell person, Grant! Thanks for all that you do! Greetings to our citizen of the world tutor, Katherine Coakley! Katherine was born in West Germany, raised in the midwest, and explored her teens in Thailand before settling back into the U.S. her junior year of high school. She is currently an instructional assistant for elementary grades 2-5, and brings much needed harmony to the classroom. “If students need to stand up for what is right, then they should do so, but gently. They should try their best to eliminate anger, jealousy, hatred of others, and prejudice from their behavior. Always replace the negatives with positives by showing kindness!” Katherine has a passion for language arts and the joy of learning. She also likes to point out how students humble themselves in a learning environment: “They willingly surrender their minds, hearts, ears, and oftentimes, their voices to teachers for the sole benefit of acquiring knowledge. Keep doing what you’re doing, Katherine. We’re honored to have you as part of the Andson family! When Andson added their Homework Help program to Whitney Library, we knew just who to call: terrific tutors Theresa Weir and Pam Locascio! Theresa and Pam are no strangers to helping students excel, so naturally they were the perfect candidates to take on our new location. Get to know a little more about them below! taught in Florida before coming to Las Vegas. is a major bingo enthusiast! loves painting murals, hiking, and traveling...she does it all! has been teaching for 27 years (20 at CCSD). loves chess and is a sudoku master. creates crafty gifts such as her famous “Glow Glitter Cannisters.” Ask her about these if you get the chance...they’re amazing! Keep on shining bright, Andson tutors! Andson Teams Up With MyPath! Andson is proud to announce our involvement with MyPath! MyPath is a workforce development program that radically alters the fiscal lives of those in situations of low income or poverty. MyPath’s objective is to empower youth through economic mobility, and they do so by providing training and curriculum for community leaders to implement. Andson’s passion for financial literacy supplements their application-based approach perfectly. Combining their focus on the power of savings, with our detailed finance lessons is a mighty force to be reckoned with. Andson plans to work with Nevada Partners, Boys & Girls Clubs of Southern Nevada, amongst other nonprofits to reach the goal of financial capability for more youth and young adults in our community. To learn more, or get involved, be sure to keep checking back on our website for updates on MyPath. As the 2016 Olympics kick into high gear, we want to acknowledge one of Andson’s very own astounding athletes, intern Elliott Davis. Elliott is a champion runner of the Junior Olympics, Region 15. The Junior Olympics is a training program that exposes young athletes to once in a lifetime competition opportunities. Elliott was inspired to start running by listening to stories of his mom’s experience with college track. He’s been committed to training since his first year of high school. What keeps Elliott motivated when the going gets rough? “Our races are usually filmed, so every race, even if I lose, I get to find out exactly what I need to do next time to win. I can see what I did wrong and move forward from there,” he explained. Elliott just graduated high school and plans on attending Central Arizona College on a full scholarship. He wants to major in sports related marketing and business to assist with his blossoming track career, and also enjoys graphic design. His advice to other runners is straightforward and honest, “It’s going to hurt, no matter what. The workouts and practices are going to hurt every day, but you get to expose yourself to really important people in the end. It also helps to write your goals down.” Well said Elliott. This is his second summer interning with Andson. We look forward to seeing him go for the gold! It’s time to introduce our wonder volunteer, Rithy Khim! Rithy is currently attending UNLV and has passion for chemistry. He aspires to one day graduate from Roseman University with a PHD in Pharmacy! Rithy spends his time with Andson as a volunteer tutor at The Gay & Lesbian Community Center of Southern Nevada. “I’ve always wanted to help people by giving them something that they could keep forever,” he shared. “I realized that that something is knowledge. That’s why I became a tutor: to spread knowledge.” In his spare time Rithy loves swimming, listening to music, and training in Tae Kwon Do. He was even captain of the Clark Swim Team in High School! Thanks for all of your time and dedication, Rithy! Meet Lorraine Kerr, our voyaging volunteer! She loves sailing the ocean and traveling across the globe. Her adventures brought her all the way from Toronto, Canada to right here in Las Vegas! 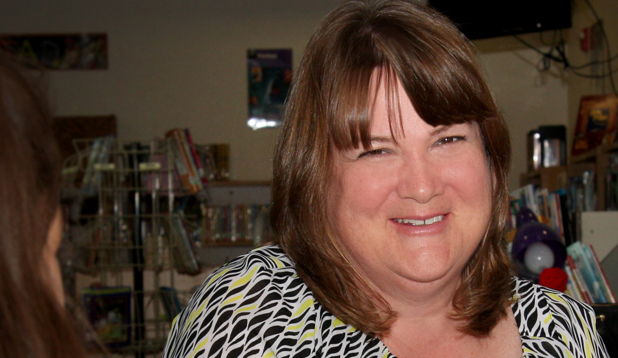 Lorraine teaches all grade levels at Bridger Middle School and her favorite subject is math. “I encourage my students to always ask questions. I’m passionate about ALL children receiving a great education,” she enthusiastically explained. Lorraine has two Cairn Terriers that she considers to be just like her students, “One is hyperactive and one is very shy; very similar to the personality mix you’ll find at any school!” Thank you for everything you do, Lorraine! Lorraine and Rithy are just two of many wonderful volunteers we’re honored to have on our team. Whatever task it may be, and whatever organization it may be for, volunteer work is crucial for the positive changes that we see affecting lives all over the globe. Volunteering is good for the volunteer themselves too. Reaching out to others fosters a sense of purpose, peace of mind, and emotional well being. To each and every volunteer out there, thank you. Andson Money Review: Financial stability on the go! Mint can do it all! Mint's main attraction is that it syncs directly with all of your accounts and pulls them into one central hub. Whether it be checking, savings, credit, or even investments, the app displays it all in a user friendly list-type view. Mint then shows user's spending by category in easy to interpret circle graphs. These visual aids help to create a budget in no time. Are you the pencil and paper type? Well you're in luck, this app is great for people who have a tendency to write reminders on whatever surface they can find! Mvelopes is geared toward saving as your main priority, and makes this happen by allowing the user to separate out bills and other costs into digital envelopes. It even has the capability to record your receipts and other paper transactions. Though this app is on your screen, the labeled envelopes give it a more tangible feel of monetary organization. Though this could be said about any money management tool, Level Money really zeros in on smart spending for the user. It informs users what they can spend "safely" each day based on income and expenses. It also displays where, when, and how they're spending their money each month in categories such as Food, Ridesharing (like Uber), and Entertainment. This tracking is great for creating a personalized but flexible budget. 1. Use strong passwords for all your accounts. 3. Don’t modify your phone. 4. Report a lost or stolen device. 5. Only download apps from a trusted source. 6. Don’t open suspicious or unexpected attachments. 7. Keep Bluetooth turned off when conducting mobile banking activity. 9. Review your accounts on a daily basis. Andson Access is Andson's non-profit networking program. Organizations and philanthropic individuals can sometimes have difficulty finding their way into each other's lives, so we step in to help make those connections! One particular young and caring individual, Sean Avne, recently completed an internship with the Global Charity Foundation through Andson Access. "I first came into contact with Andson Access through Anthony himself. Being able to learn more about non-profit companies seemed very interesting to me," he explained, "I then met Dr. Thukral of the Global Charity Foundation at an Andson-sponsored Tesla event. She was in need of an assistant, and I fit the bill!" The job consisted of Sean filling out grant applications, preparing for the annual gala, and using new technologies. "Being a part of Global Charity Foundation and working with Dr. Thukral was a fantastic experience!" The internship allowed Sean to take his UNLV class studies and apply them to real-world situations, which he thoroughly enjoyed. Through Andson Access, Andson provides hands-on experience to college students, better preparing them for whatever life may throw their way. Way to go, Sean! Just a few of our wonderful tutors. In honor of Teacher Appreciation Week, we want to take a moment to talk about our tutors. Not only do they teach in CCSD schools 5 days a week, they also spend endless hours, often on their own dime, grading papers, organizing materials, purchasing supplies, and doing countless other tasks outside of the classroom. On top of that, they choose to spend what little free time they may have helping the students of Andson. To call them selfless would be an understatement. This jam-packed schedule doesn't keep them from being super enthusiastic either; our teacher-tutors are always smiling, patient, and full of knowledgable energy to share in any learning environment. So, in the most genuine of heart, we want to say thank you. Thank you for all you are, and for all you do. Andson Review - Banking Made Simple! First and foremost, Andson is not compensated for this endorsement. We just like to share what works for us! Of the various resolutions we see come time and time again every New Year's, financial goals are a popular recurrence. As 2016 starts to unfold, Andson wants to help bring personal and financial resolutions to life and longevity. We are always on the lookout for new and innovative ways to get people psyched about how they handle their money, and saving! So Anthony set out on an investigative adventure for simpler banking... with Simple! Many banking apps are second in priority to the actual physical bank they are attached to. This results in the app being unavailable due to constant maintenance, or just having a general non user friendly system. "Because of my experience with banks who put little effort into their mobile banking, I became interested in finding ones with a great mobile friendly system," he explained. "Simple caught my attention very quickly!" Anthony received a personal inquiry response within 24 hours. Simple is a personal banking system that lets users take complete organizational control of their income and expenses. There are two components: the app itself, and a Visa card. You begin your journey with Simple through an uncomplicated application process. Then, after your card arrives in the mail, you can start customizing your finances on the Simple app. The app has an easy-to-use budgeting feature and even allows you to set savings goals. Simple is partnered with Bancorp Bank and is FDIC insured. "There are no fees and the card can be used at any ATM. The packaging that the card arrives in , and the card itself are also quite nice looking. I can't wait to explore more of the app's functions," Anthony reported. We will continue to catalog his time spent with Simple right here on the Andson blog. Check back soon for more updates! Our committed and charismatic COO Mr. Anthony McTaggart is at it again! The popular educational resource website, Edutopia, has published a piece by Anthony about the importance of integrated financial literacy in all communities. And what exactly do we mean by integrated? "Financial education, literacy, curriculum, or planning -- whatever you want to call it, doesn't go as far if you don't pair it with practice," Anthony relayed to readers of Edutopia. "This was the idea that spurred the revolution we now see in Southern Nevada. We have students actively involved in learning about personal finance while actually saving money weekly," he continues on in the article. Andson's financial literacy program, Andson Money, has developed curriculum based on national standards. It covers everything from the basics of needs vs wants, to how advertising can influence a consumer's purchase choice. Andson strives to provide unique, engaging lessons in personal financial education to youth grades K-12. Anthony shared this information and more with the intent of guiding groups and educators who are interested in starting financial literacy in their own community. The article can be found at the link HERE. October 14th was a big day-- It was the grand re-opening of the Piggy Bank Program at Hollingsworth Elementary School! Through a collaboration with Andson, United Way’s Young Philanthropist Society, Silver State Schools Credit Union, and Hollingsworth faculty, the students and trained staff members facilitate the savings program every fall session. October 14th marked the second year in which the Piggy Bank has been operational. “The kids were so overwhelmingly excited! The bar was raised with their returning enthusiasm for the Piggy Bank,” said Andson Money program director Diana Ritchie. Students were heard sharing without prompt what they wanted to save for, and it was a lot! Everything from cars, to college, to a house for their parents was being pursued. “Seeing the students walk away with a smile, excited to tell me when they’ll bring in their next deposit was so rewarding!” Diana swooned. One student even discovered in a conversation that he would like to be the first person in his family to go to college. Hollingsworth deposit amount... $881.34! That's almost $200 more than the deposit on the 1st day last year. It was quite a successful day and definitely a signifier of a successful year! We look forward to growing with you Hollingsworth! Andson has been featured on the front page of the Nevada Banker’s Association News Bulletin for September 2015! The piece provides a wonderful overview of all Andson programs, as well as insight from Anthony and Sonia. The main spotlight is focused on the inner workings of Andson Money, our financial literacy program. “The core curriculum for Andson Money was developed by Andson, and it is continually updated and amended to meet the needs of each demographic of students being served. Andson Money strives to provide meaningful financial education lessons to youth,” they reported. They also note the key role that academics play in financial education, and discuss our after school and summer outreaches. “At Andson, the primary goal is to support the vital aspects of development, equipping students with the necessary life skills to close the education gap and avoid the financial crises that often plague the adult lives of at risk, disadvantaged youth,” NBA writes. To read the whole feature, click on the images below! How did you hear about this grant opportunity? Was there something different or unique about the process of this particular grant in comparison to previous ones? How will you go about allocating the funds to programs within Andson and our schools? How do you feel this award will help to propel our programs even further? Any advice you’ve taken away from this experience that you could offer to other “young” foundations? Wonderful insights from a wonderful leader! And a BIG thank you from the bottom of our hearts to both Credit One and Grantwell for giving us and our students this spectacular opportunity!! Monday July 27th, 2015 was Andson’s very first time participating in Cabanas for a Cause and wow-- what a way to kick off the week! Cabanas for a Cause is a local charity event through the Palms Pool & Dayclub, where the proceeds of cabana sales for a day, go to a selected non-profit. So, as long as you mention the foundation's name when booking a cabana, they will receive 100% of the profits! The cabanas were priced at $100 and came equipped with a flat screen TV, mini fridge, ceiling fan, speakers, and enough seating for up to 10 people. Outside of each cabana was a daybed with plenty of towels and an umbrella. We caught up with Andson employee Nevena Cvijetic in her cabana, and asked for three words to describe how her poolside day was going, “Mellow, relaxing, and fun,” she smiled. Looking out over the crowd, another two words we would use to describe the event would be family-friendly! Several kids giggled and splashed around in the water as parents watched carefully from the sidelines. There were even a bunch of inflatable pool toys in the shape of sunscreen bottles available for everyone. Overall, it was a fun and worthwhile summer experience, and we hope to participate again! And if anyone is wondering, the girls were NOT there on company time (: Andson is lucky to have dedicated employees that were excited to support the cause. Does the ability to physically grasp something mean it will have a lasting positive effect on us? "There's a very logical assumption that most people make when spending their money: that because a physical object will last longer, it will make us happier for a longer time," writes Jay Cassano. He's analyzing a theory (proposed by Dr.Thomas Gilovich of Cornell University) that experiences, although ephemeral in nature, keep people genuinely happier than buying new material items. The idea in summation is this: we get used to being around the same physical object over time, so it's value to us diminishes. But an experience like travel or a concert especially with loved ones becomes an ingrained part of you, rather than something that's just around your presence. "You can really like your material stuff. You can even think that part of your identity is connected to those things, but nonetheless they remain separate from you. In contrast, your experiences really are part of you. We are the sum total of our experiences," states Dr. Gilovich. The article then goes on to discuss why people tend towards purchasing instead of experiencing even though one outweighs the other in arguable benefits. All in all, both Jay Cassano and Dr. Thomas make for compelling and truthful food for thought that could change anyone's life with a simple read through of their insight.